Trip leader - Rob H-F.
Bernice, Kip and Bruce leave Pasadena at 8:00am in the hopes of getting a couple of runs in on Thursday afternoon. An uneventful drive, except for stopping in Big Pine for some photos of the Mammoth Knit Cap sign, we arrive at the condo at 1:45 pm. We quickly unload the car, get our ski gear on, and head for Eagle Lodge. The mountain is covered with a cloud and the low visibility keeps the top closed. 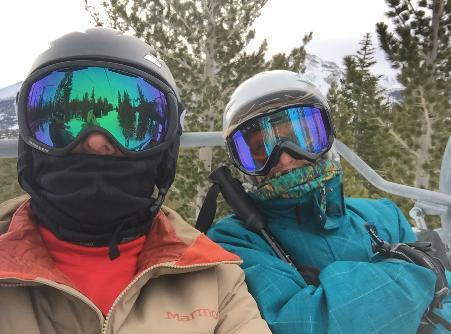 We meet up with Mary Jo and ski around Canyon Lodge. I got 9 runs on the snowboard on Chairs 16 & 4, and then we all meet back at the car at 4:20pm. A great way to start a long, 3.1 day weekend ski trip. We then head to Mammoth Tavern for the Happy Hour dinner. Meanwhile, Aili & Chris and Rob and new member Victor are on their way from LA. Weather predictions are calling for a 100% chance of snow, so we put the chains on Bernice’s car. 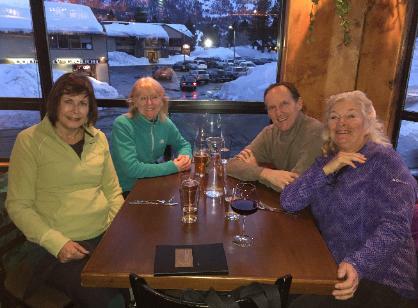 Kip, Mary Jo, Bruce and Bernice, members of the Mammoth Mountain Knit Hat Club having it to Bruce. Looking out the window the next morning, the snow is really coming down with about 4” on the cars. Everyone is up early for breakfast so we can leave by 8:10 to get a good parking space at Eagle. Two cars go there and Chris and Aili take the bus to Main Lodge. 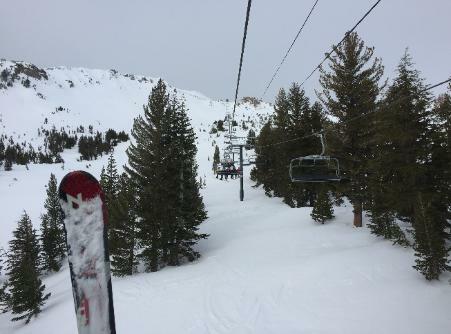 We make a few runs on Chair 15 and then head to Canyon and Chair 16. It is snowing hard and the visibility is limited. I leave the ladies and head to Chair 2 and the other part of the mountain. Stump Alley Express is the highest lift that will be running today. It is very windy and snowing hard. I break for lunch at McCoy station and run into Rob, Victor and Aili. Chris has had enough and headed for the condo. The ladies had lunch at Canyon. After a few runs on Chair 2 after lunch, we four head for Canyon in hopes of better weather. It is a little better, but not enough for Rob and Victor who head in. Aili and I make a few more runs, but Chair 2 is now closed and so we head for the car at Eagle. As the five of us are driving to the condo, a little blue sky shines through the clouds as a good sign for tomorrow. As we did on a previous trip, the Club dinner will be on Friday Night. Our Trip Leader is getting ready in the Jacuzzi. Some members of the San Diego Action Ski Club are staying at the same condos and have filled the pool. Hi to Evelyn. Now fully refreshed Rob, with helpers Kip and Mary Jo head off to the market and to Z Pizza to secure the ingredients of our dinner. After a small skirmish regarding the best cookies for dinner, they all returned and we had pizza, salad and ice cream and two kinds of cookies. All good. Bruce's ski and Bruce on Cloud Nine Express on Sunday. Bruce and Mar Jo on Cloud Nine Express. Saturday is early-ups so we are at Eagle Lodge and on the chair by 7:50am. We head to McCoy Station for the free breakfast. I decide to keep skiing and find some icy powder on Chair 25 before it breaks down for 20 minutes. I change from board to skis and when I get back to the Eagle lift, the line is so long I take the bus to Main Lodge. Up Chair One and meet our group as I ski to Facelift. It is the best snow of the weekend. Wind-blown grooming and powdery snow. I ski Chair 3 until 1:30 and then go in to lunch with Aili, Chris and Bernice. After lunch we are all skiing Chair 3 until the end of the day. Only the Gondola is running to the top and Chairs 9, 25, 5, 14, 23, 22 are all closed on the busiest day of the year. There are long lines at every operating lift. Rob buys more salad and lasagna for Saturday dinner and we all eat in. Thanks to Bernice for pulling it all together. And thanks to Rob for handling the Trip Chairman duties. 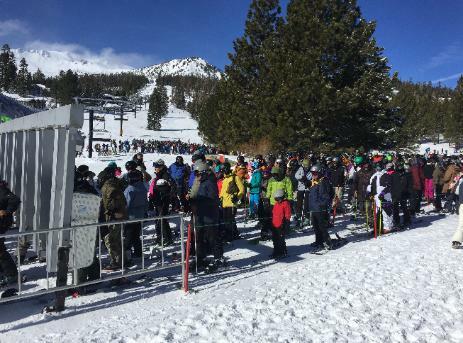 Eagle Express lift at 10:00am with line stretching up the hill. 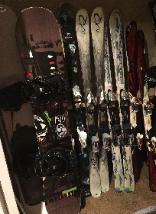 Chair 25's line. 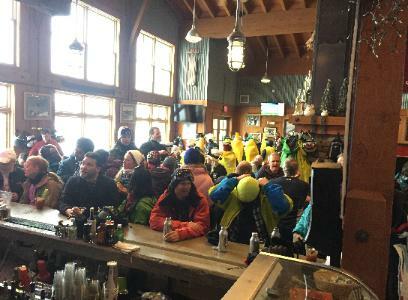 Lift shut down and everyone went to Eagle. PS. That storm drops 12” of new snow and it is supposed to snow the rest of the week and be sunny when the mid-week group arrives on the 12th. 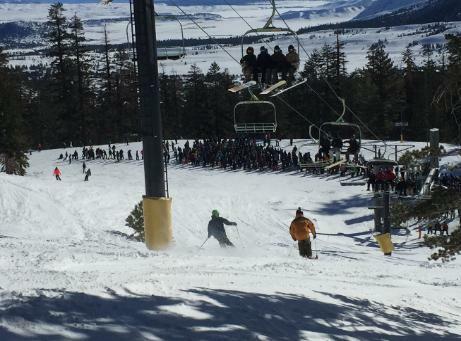 Mammoth is breaking all records for snow fall. We may be able to water grass this summer, except Kip who took it all out and planted bark. Yes there were human bananas in Mill Cafe, plus 15 more outside. 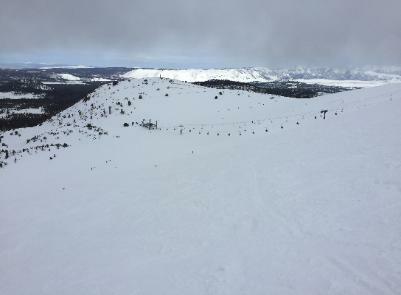 Scotty's and Chair 23 were wide open on Sunday and great snow. Keep the prayers and good thoughts going to Bear & Marty.